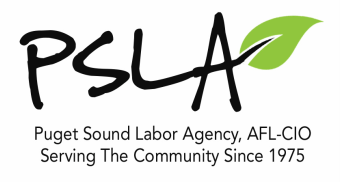 ﻿The Puget Sound Labor Agency (PSLA), AFL-CIO was founded in 1975 by local labor unions to serve their neighbors and to give back to their community. PSLA, AFL-CIO is a 501c3 non profit organization. The generosity of union affiliates, union locals, union members, and individuals through charitable workplace campaigns help to fund the services we provide to the community. Donations to PSLA can be done online through AmazonSmile, Rally.com and Fred Meyer Community Rewards. PSLA, AFL-CIO is a 501c3 non profit organization.